A leaky gutter can be a bit of a pain. Completely defeating the purpose of the gutters themselves, these leaks can range from an annoyance to devastating. Before we go over how to protect your home’s exterior and foundation, let’s first look at some of the root causes, with the help of ZA Groundworks Ltd, which does groundworks in Basildon. Leaks rarely are a result of simple holes, though that can be the case. One of the most common causes of a leak are leaves, twigs, and other debris. Other issues include cracks, improper slope, loose fasteners, and the joints separating. Fixing your gutter is an important step in safeguarding the exterior of your home from leaks, rot, and mold. While there are many ways a gutter can leak, it is almost always a result of not properly cleaning and upkeeping them. Over the course of the year, natural junk has a tendency to accumulate in your gutters, whether it be fallen leaves, broken branches, or even buildup of eroded shingles. Regardless of what the source is, all gutters should be cleaned from time to time to prevent them from overflowing. All you’ll need is a hose, bucket, gloves, and a ladder to get the job done. Merely go up to the gutters and scope them out, flinging all the gunk into the buckets. From there, you’ll need to blast the rest of it away with the hose to ensure that the water is flowing correctly. Gutters are often attached to the roof via hangers, nails, or screws. While a necessary evil, this means that these are the weak points in your gutter. Over the course of months or years, these weak points can become loose, resulting in water slipping through the openings. One of the best ways to avoid this is to occasionally going up to your gutters and retightening them. Keep in mind that a fastener is only as good as the material it is screwing into. If the fascia boards are rotted, it won’t matter how tight you make that fastener. After several years of use, certain parts of the gutter can start to erode. This corrosion can, over time, cause cracks in the gutter that are only exacerbated by the continuing water flow and debris accumulation. In severe cases, this can lead to the gutter breaking apart completely. How you repair the crack depends on its size. A small crack can be sealed up with a bead of caulking or sealant, while larger ones will need a bit more work. It’s best to push larger sections together and refasten them, then attempt to seal them back together. It is possible that a potential crack could just be a hole. Similar to cracks, a hole in a gutter is often the result of water or debris pooling in a certain spot, accelerating corrosion in that area. Over the course of months or years, this problem becomes larger with the onslaught of more water and debris. Thankfully, there are a few ways a hole in a gutter can be fixed. Using simply a bit of sealant is the easiest way. Other methods for fixing include using official gutter repair kits or even a method that involves an aluminum can and tin snips. Needless to say, a gutter that isn’t properly hung won’t have enough slope to drain correctly. Even if the gutter was originally hung right, changes in temperature and the weight of debris can alter the slope just enough that the gutter won’t be able to do it’s job. This is, unfortunately, one of the tougher problems to conquer. 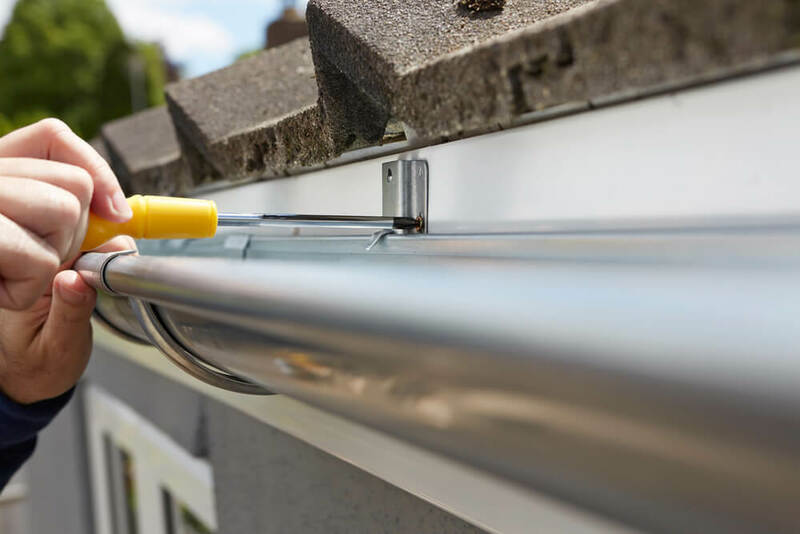 Typically requiring some sort of re-hanging, you need to make sure that the gutter has a slope between ¼” and ½” for every 10 feet of material. This will probably require a chalk line to measure correctly. Aside from the fasteners themselves, one of the weakest point in any gutter construction are the joints. Corners are especially prone to accumulating all sorts of junk and water, putting more pressure on these already weakened spots, resulting in leaks. There are a couple ways to fix a bad joint, Oftentimes, just a little bit of sealant or caulking will do the job. If the corner is still sagging at the joint, you might need to take some time to simply replace that section of the gutter.